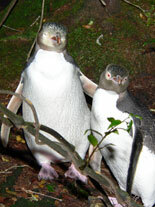 A 5-year project, 2003 – 2008, was initiated in response to an observed decline in the number of breeding pairs of yellow-eyed penguins. Surveys in the early 1990’s estimated there to be ~600 breeding pairs on and around Stewart Islands, but the Trust’s own comprehensive population census work in 1999 – 2002 found only ~200 breeding pairs. Also observed were a low number of juveniles and a large number of unexplained chick deaths which were of significant concern. Identifying the problem will provide the relevant guidance for ongoing management of this threatened species. The Trust is particularly interested in what happens to the chicks in their first month, and will be taking weights and measurements over this time. This will allow researchers to compare the growth rate of each chick with the expected normal growth rate. Assumptions can then be made about the food supply – if the growth rate is slower than normal right from hatching then the food supply may well be the main problem. If the growth rate begins well then slows later, it could be that disease is kicking in after a couple of weeks, which in turn causes the chicks to starve and growth to slow down. In contrast to Year 4, which resulted in 0% breeding success in the monitored area on Stewart Island (the Anglem coast) and lower breeding success on the monitored off-shore islands than in previous years, 2009 was much better. Six chicks fledged from the Anglem coast. This is the best season of all during this study for these island groups, perhaps influenced by the spectacularly fine summer and La Nina weather patterns experienced this season. However, it is even more obvious that all is not well for the birds along the Anglem coast. Firstly, only 16 nests were located, compared to 32 nests which were found along the same stretch of coast during the Trust’s comprehensive survey of Stewart Island in 1999. That is a very disturbing statistic showing a considerable reduction in the number of breeding pairs over 9 breeding seasons. Secondly, of the 25 chicks that hatched from those 16 nests, 19 died and only six survived to fledge. All of the chicks deaths occurred before Christmas, during the Guard Phase, and most chicks died within three weeks of hatching. No predation was recorded, but starvation and disease were once again evident as causes of chick death. Of course, this alone won’t answer all of the questions, but with the continuation of other external research into the foraging behavior (i.e. where birds go to feed, how deep and how long their dives are) of birds on Stewart and Codfish Islands, more may be gleaned. 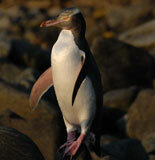 Also The Yellow-Eyed Penguin Trust Fund began a study of the penguins ‘diet, and a more detailed investigation into the disease aspect of these birds. Researchers are hopeful that the end result will be a lot more detailed information, and, hopefully, some answers. The Trust is proposing to carry out a full survey of the Auckland Islands in order to obtain a clear picture of the status of yellow-eyed penguin nationally, and to obtain a baseline for future comparison of changes in distribution and abundance. However this research will have to wait until necessary funds have been raised.